Welcome to our April First Friday Breakfast with author Katherine Sartori. Katherine’s dream of writing novels dates back to her childhood. Her debut novel, THE CHOSEN SHELL, was published in 2013. She’s ecstatic that her book has earned a 5-star rating on Amazon! The novel was inspired by Sartori’s years as a Catholic nun in San Francisco from age eighteen to twenty-three. After leaving the convent, she completed her MA in Communications and spent over 25 years writing for Fortune 500 companies. Creating multiple sales training and advertising materials as well as editing technical manuals, she was then hired by California State University, Fullerton, CA to create and teach her own writing curriculum. Since going freelance, she has published several national travel articles and a short story about her daughter in “Mending Shattered Bonds,” which appears in The Cup of Comfort Book for Single Women. Now, when she isn’t traveling the world with her husband Joe, she is busy writing her column “Writing Craft” at http://www.LitCentralOC.com or completing her next novel, LILY and EVE, to be published in 2014. 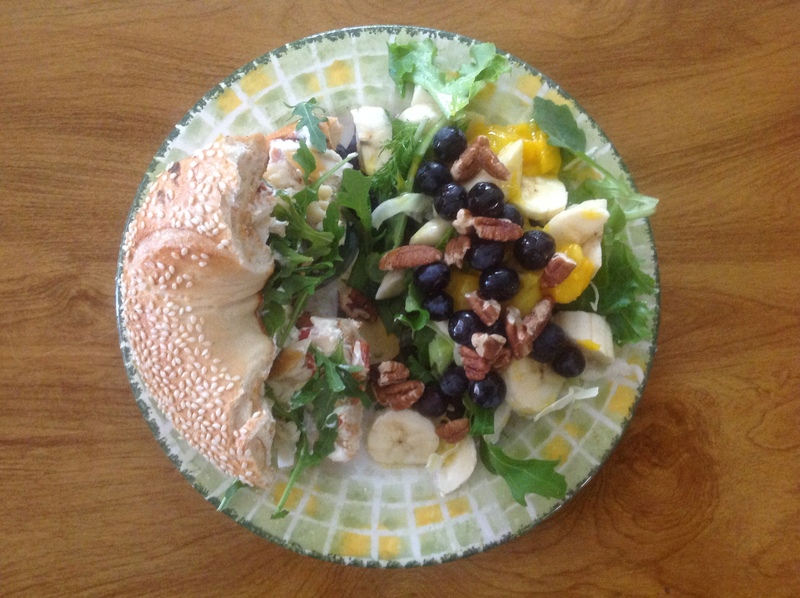 This morning I’m enjoying a half bagel with cream cheese and sun dried tomatoes, smoked trout, and arugula with a mixed green salad of blueberries, banana, mango, olive oil and pecans. What are you having for your virtual breakfast, Katherine? How about if I describe my “nightmare” breakfast first?–bitter black coffee, stale donuts and canned fruit. Since we’re talking about my novel THE CHOSEN SHELL (which is part memoir), this was my breakfast years ago while I was in the convent. That is, IF someone remembered to pass me a plate of food. According to monastic rules, we had to keep silent during meals and were forbidden to even nod to someone in order to ask them to pass food—one of our many sacrifices. Luckily, most of the time everyone silently watched out for each another. But I often gave up salt and pepper because no one remembered to pass them my way. To this day, I won’t give up sprinkling salt and pepper on my favorite virtual breakfast: a cheese and veggie omelet. But with fresh berries and a Starbuck’s hazelnut Late’ coffee as well! Fascinating introduction to your book. Tell us about your writing process and what inspired you to write your novel. 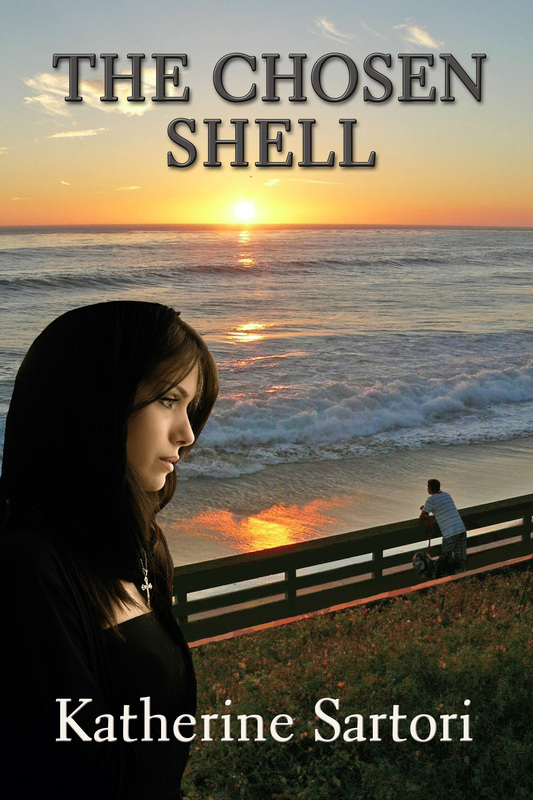 Surprisingly, The Chosen Shell (unlike the novel I’m writing now) was a story that almost wrote itself, since a lot of it is based on my own life. I’d sit at the computer and scenes would spill out of me, as if an inner fountain had finally found an opening from which words erupted, filling the pages with feelings I didn’t know I had. The cathartic release it gave me filled me with all kinds of emotions, including anger and sadness, but eventually relief and joy won out! I’d waited almost thirty years before writing my story. During all that time, for the most part, I’d kept my years as a nun a secret. Why? Because I knew the people I met would stereotype me before they took time to get to know me. Though much of my novel is fiction and many characters are composites of people I met in the convent, much of the book is true: the cultish monastic rules that stunted my wavering personal confidence; the life-long friendships I made and still enjoy today; the disturbing sexual assault that happened to a friend of mine; the dysfunctional Irish family that molded me into a naïve, idealistic young woman who sorely lacked confidence in her own gifts but had an abiding faith in God and the courage to change. I’m topping off your hazelnut latte. What did you find fun about your story? What was difficult? We all long for the chance to rewrite our lives, don’t we? As I progressed further in writing the book, I had fun playing with a “what if” idea I’d learned at a writing seminar. I fantasized about a question that nagged at me: What if I’d met my “now” husband, not in 1982, but back when I was young, in 1967, when I was a nun wrestling with the decision of whether to renew my religious vows. So I crafted a scene where my protagonist Celie O’Rourke meets an accomplished New York businessman named Tony at a retreat house in Santa Cruz, but he has no idea she’s a nun because she’s decided to wear secular clothes there. The retreat house on the California coast was very real. I actually stayed there for a weekend in 1968 and finally decided to leave the convent. But meeting Tony there was pure fiction. After that, I had fun playing “What If” again, inventing meetings throughout my story between Celie and Tony, where he reveals his own sorrow about his failing marriage and also becomes a valued friend…but the bond they feel is electric…yet forbidden. For me, the revision process is my least favorite. Nonetheless, I revised my first draft over five times–especially the beginning chapters, which were moved and changed, and moved again. Then life intervened and for years THE CHOSEN SHELL’s manuscript languished in a drawer somewhere. If it hadn’t been for my husband Joe and my writing critique group, who began reading my chapters, I doubt the story would’ve ever been published. They encouraged me over and over, urging me forward, telling me how much they liked my story. So I followed their advice, and now I couldn’t be happier. I’ve discovered how many others love my story too! I’m busy creating a “Writing Craft” column twice a month now for the O.C. Writers’ online magazine at www.LitCentralOC.com. Check it out if you want to discover some fresh ideas about plotting, characterization, setting, pacing, etc. My most important goal this year is to complete my second novel. LILY and EVE is a story about two very opposite, lifelong friends who venture off to Ireland together in order to heal very different personal scars. During their journey they not only discover irresistible Irish men, mysterious Celtic tales, ancient burial grounds and faery fantasies, but they also uncover passions that forever change them—threatening their friendship…and even their lives. When the book is published in late 2014, my goal is to travel to Ireland and follow Lily and Eve’s journey myself. Who knows? I may discover some faeries there myself! I’ve been reading your articles on craft since day one. I heartily recommend them. I do love stories set in Ireland and look forward to seeing Lily and Eve published. Thank you for sharing your breakfast and writing life All my best for your new book. Check out Katherine’s website at http://www.katherinesartori.com for her latest updates. Follow her blog on http://www.dreamtravelerkas.blogspot.com. I already have Katherine’s book and highly recommend it. Before you blast off to Amazon to get your copy of THE CHOSEN SHELL or click http://tinyurl.com/k4f8ph3, who would like to join us for a cup of her favorite Starbuck’s hazelnut Late’ coffee? This entry was posted in Food, Uncategorized, WRITING and tagged A Cup of Comfort Book for Single Women, author, Catholic nun, Ireland, Kas Sartori, Katherine Sartori, LitCentralOC, The Chosen Shell, writing, writing process. Bookmark the permalink. I share Katherine Sartori’s fave–a veggie omelet with cheese breakfast! Her book sounds moving, and she has led an unusual life! I like veggie omelets too, but without the cheese. It’s a fabulous book! My convent years were a great learning experience, Kaye, filled with heartache and joy as well. Lots of people yearn to align themselves to their life purpose–I’m pretty sure I know what that is now…at least for the moment. Thanks, Michelle, for your praise of my story– The best reward of being an author is to know you’ve touched others’ hearts. What a wonderful thought to start the day. Thank you, Katherine. I read the book The Chosen Shell and not only loved it, but also learned interesting details about the social aspects of convent life, some typical, and some hardly typical!. None of which I will share here, of course, because I don’t want to spoil it for others who read it! Great interview with Katherine!